GoGuiltyPleasures Gets Slushied: Behind the Scenes! Post-slushie. ...I think pink highlights could work for me. Chipmunks, I know you’ve just been dying to hear more about my Glee slushie experience after watching the presentation in my last post, Why Glee Makes My Soul Sing. And what kind of guilty pleasure blogger would I be if I didn’t indulge your every whim? So. Would you? Slushie in the face? Why or why not? *Lover of cheese by choice. Guilty Pleasure Overdose…Someone Call 9-1-FUN! Chipmunks, I… I can’t even… I mean it’s just so… Deep breath. Okay. I’m having trouble typing because of THIS ARTICLE. Second Husband (Darren Criss) + People’s Sexiest Man Alive photo shoot = eating peanut butter cups and drinking champagne on a cloud while watching Glee and having someone tell me I’m perfect. Clearly the guilty pleasure gods wish to appease me. He looks like Eric from The Little Mermaid*. Or, you know, like every dream come true. I am going to have to add a new bullet point to my “Why Polygamy is the Right Choice for You” presentation (if you think this presentation is just a figment of my imagination, you don’t know me very well): You can be the pretty one in the relationship. Pinky swear. All right. I think I can move on now, to what this post was originally supposed to be about (oops). I saw Twilight: Breaking Dawn Part 1 this weekend (I’ll give you a moment to recover from the shock). I thought it was a lot more carefully done than Eclipse and I always enjoy seeing my favorite books come to life on the silver screen. 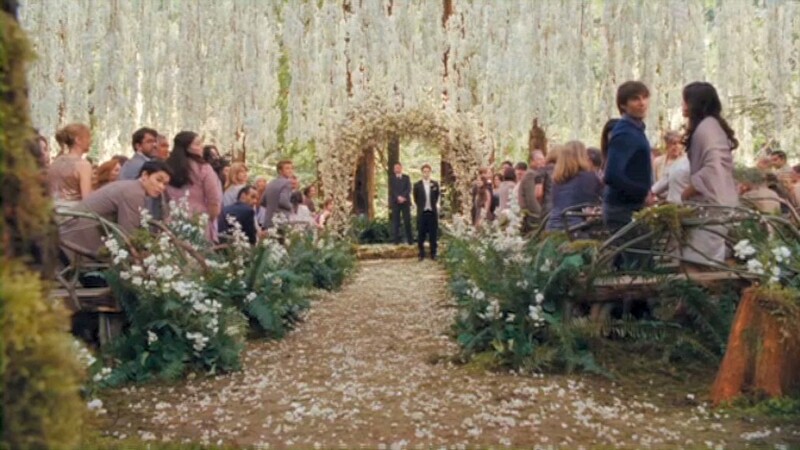 I especially loved the wedding speeches and the closing shot. You’re the dinglehopper to my bad hair day. The Guilty Pleasure Gods Are Smiling – Here’s Proof! Alvin, Theodore, Simon. All my awesome little chipmunks. I don’t even know where to begin. Since my last post, so many amazing things have happened. I think it’s because the guilty pleasure gods finally realized they have wi-fi, and have subsequently read my blog, and are letting me know they’ve heard me. I know. My, I mean the gods', best work yet. 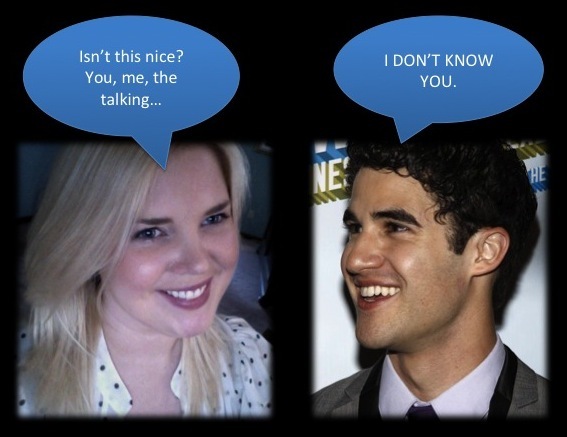 PROOF #1: Blaine. Is. In. New Directions!!!! That’s right. Like with any husband of mine, soaring instantly to success is inevitable. 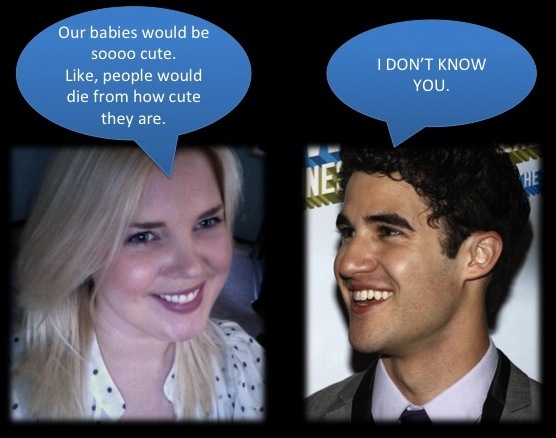 Darren Criss, a.k.a. 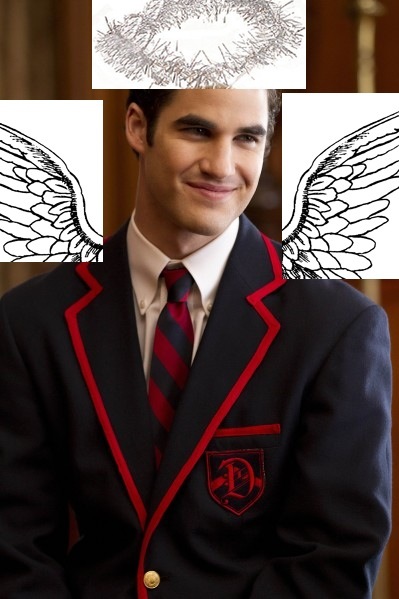 Blaine Anderson on “Glee”, a.k.a my Second Husband, has left Dalton Academy to join the rest of the cast at McKinley High. That is no easy feat (except for the 10,000 people they let win “The Glee Project” this summer). 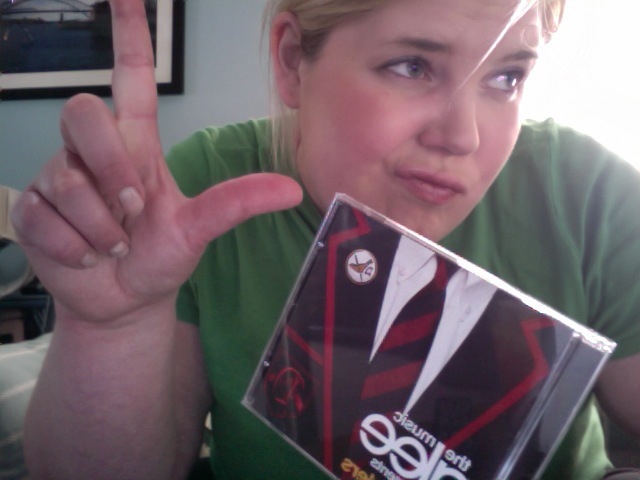 I sure do hope they keep The Dalton Academy Warblers around, though. 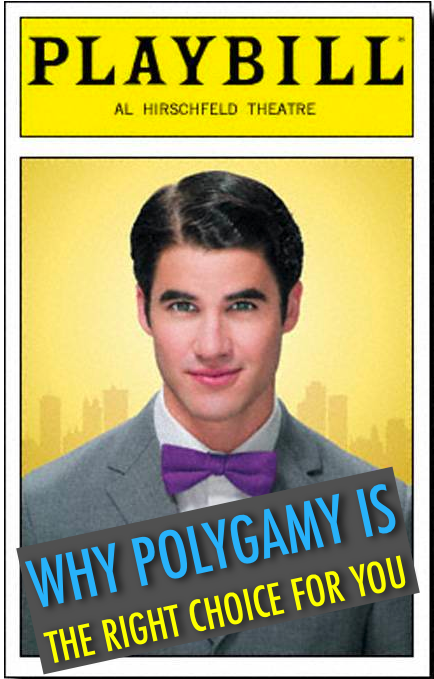 Side note: Second Husband is coming to Broadway in January for 3 weeks, to replace Third Husband Candidate, Daniel Radcliffe, in “How to Succeed in Business Without Really Trying.” I mention this because it means I have approximately 3 1/2 months to work on my “Why Polygamy Is The Right Choice for You” presentation. Powerpoint tips and public speaking pointers are welcome. PROOF #2. The Good Greatsby imparted his timeless words of wisdom upon me today. I plan on putting his advice into action immediately. You can check out the post here. PROOF #3. 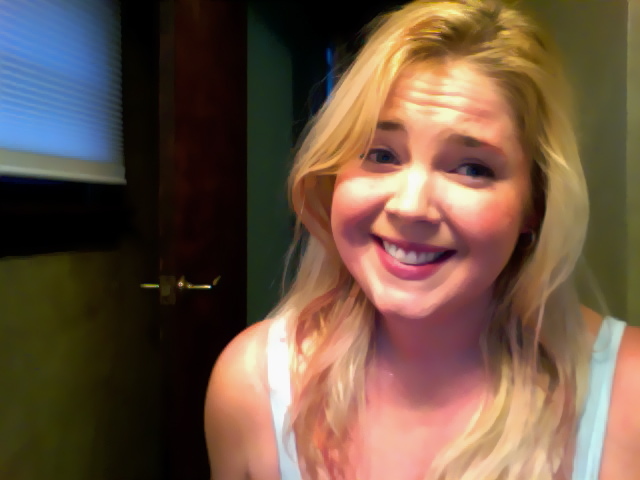 I discovered a wickedly funny blog recently: Not Quite Old. 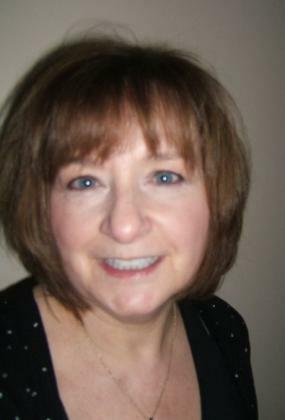 If you haven’t already read Nancy’s blog, head on over now! She was just given a Versatile Blogger Award, but I think she is better suited for the Wear-A-Diaper-Before-You-Read-This-Cause-It’s-That-Funny Blogger Award (though she certainly does show versatility in the subject matter she manages to turn into comedy gold – who knew orphans could be so chuckle-worthy?). In that way we are strikingly similar. That’s all for now. Don’t forget to say your prayers tonight*. *I should explain. The guilty pleasure gods are not all about genuflections and formality, if you catch my drift. They prefer you pass out on the couch after eating too many E.L. Fudge cookies, and you really, really need to make sure you leave the TV on. Well, I mean, only if you want to show your true devotion, that is. I don’t usually do this (except the one time I did, when I was 9 and in love with Neil Patrick Harris. And by the way, he totally sent an autographed black-and-white headshot in return. And I still kind of love him. A lot. I wish I knew where that picture was. I hope I didn’t throw it out when Elijah Wood stole my heart), but I had to tell you how I feel. Hilton you’d write him into an episode “Glee” whenever he wanted. These are not the actions of a scary writer/television producer. definitely twinkle a little. I liked the way you talked about who you could write for and why. I want to hear more. 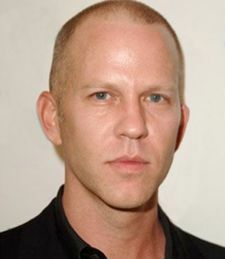 I want to know you, Ryan Murphy. 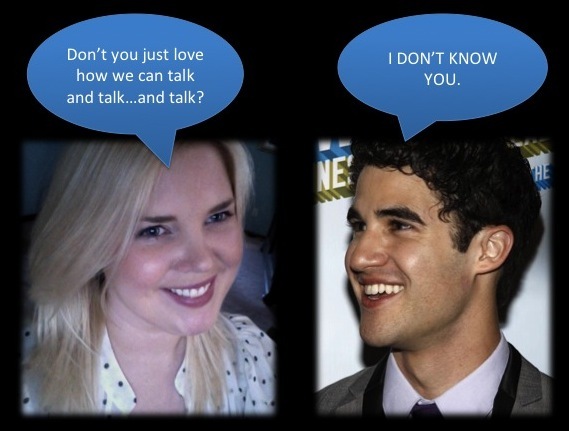 Also, if you could please tell Darren Criss there’s a 29-year-old, married project manager from New Jersey who may or may not have green hair who’s wondering why he hasn’t returned any of her calls, that would be great. Thanks, Ryan.